Mackie has had quite a NAMM show this year. We’ve already seen the company unveil a new line of in-ear monitors, but now it has also launched a new series of headphone amplifiers, and, last but not least, a few audio tools that should help out those in the studio and in live sound. Those tools include the new MDB series of direct boxes, MTest-1 Cable Tester, and the M48 Phantom Power Supply. In the MDB series of direct boxes, you’ll find a total of four models. The MDB-1P is a passive direct box, the MDB-2P a stereo passive box, the MDB-1A an active direct box, and the MDB-USB a USB stereo direct box. Safe to say, there’s probably a new direct box from Mackie for almost all, if not all, situations. Of course, the direct boxes aren’t the only new tools on offer. Mackie also showed off the MTest-1 Cable Tester, which features a five-way switch to enable users to test every pin — even those with mismatched connectors. The MTest-1 could prove to be a helpful tool in any audio engineer’s arsenal. Last but not least is the M48 48v phantom power supply, which, as the name suggests, will allow you to use microphones that require phantom power with systems that don’t provide phantom power. So what about pricing? Let’s start with the MDB series. The MDB-1P will come in at $70, the MDB-2P and MDB-1A for $84, and the MDB-USB for $210. 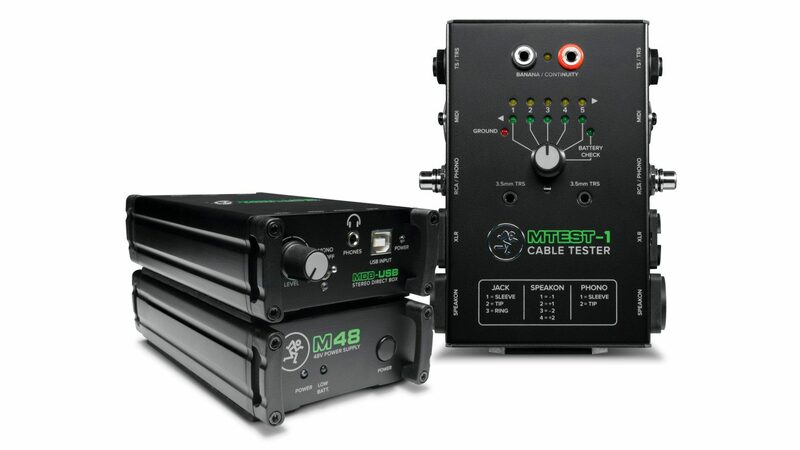 The MTest-1 Cable Tester will cost $42, and the M48 $70. All of the devices will be available starting on February 1. They’ll be available from the Mackie website, and we expect from Mackie’s Amazon store at some point too.